Start early to make the most of the day. Enjoy this day trip in Naxos with kids, which is our favourite island in the Cyclades. Naxos has an authentic feel and small-town charm. Everyone is super-friendly, the city is walkable, fairly flat and stroller-friendly. The food is cheap and some of the best we experienced. This relaxing day itinerary starts with breakfast on the waterfront at Rendez-Vous Café. Next, a visit to the most recognizable landmark in Naxos, the Portara. Enjoy the winding pedestrian streets and explore some of the unique shops. Then, head to one of Naxos' family-friendly beaches to cool off and build some sand castles. Finish off the day with a walk back to the Portara for a stunning sunset view before hitting the patio at Scirocco for the best moussaka in Greece. We loved this open-air restaurant on the waterfront so much that we came for breakfast both mornings we were in Naxos. It was affordable, quiet and had a great view of the harbour. We even saw fishing boats coming in and fisherman offloading their catch on shore and hanging them along ropes on the road. The patio is covered so it’s shady, cool and dry regardless of the weather and we were welcome to park our strollers right beside the table. DIRECTIONS This small restaurant is located along the waterfront. TIP There weren’t any change tables in the bathrooms, but just across the street from the patio are public benches and garbage cans. We used them to give our daughter a quick change before heading off to our next destination. The Portara or Temple of Apollo is a 2,500-year-old marble structure that overlooks Naxos town. It offers stunning panoramas out into the sea. It was the entrance to an ancient temple that was started in an attempt to make the grandest structure in all of Greece. However, war broke out and construction was never finished. The only part of the structure remaining is a gate that is 6 meters (19.6 ft) high. 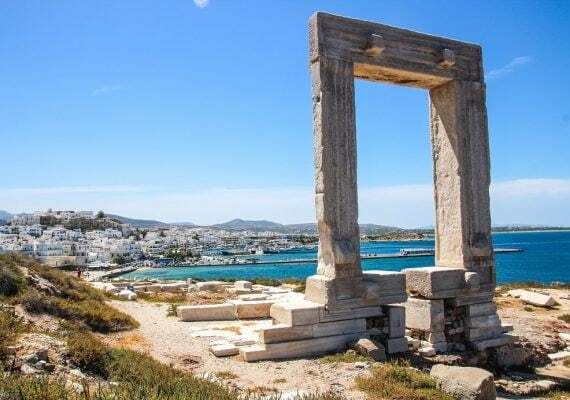 The Portara faces Delos, the birthplace of Apollo, and has a beautiful view of Naxos town. DIRECTIONS Walk along the waterfront toward the ferry terminal, you will see the Portara up on the hill in the distance. TIP The walk is stroller-friendly, but there are some steps and uneven terrain to get to the base of the Portara itself. You can park your stroller in sight and walk up or, if your stroller is lightweight, carry it up the steps. A carrier would be more convenient. If you have time, make sure to come back at sunset. We love St. George’s beach. It is wide and sandy, the water is calm and shallow for at least 100 meters (330 ft). The fact that it is so close to the city center is a plus, as you can walk there. We hear that there are nicer beaches on Naxos but this one suited our needs perfectly for a relaxing afternoon and a break from the heat. DIRECTIONS The beach is approximately 1.5 km (1.2 miles) from the Portara, but you can take lots of different routes to get there. My recommendation is to walk the pedestrian streets weaving through and heading generally parallel to the waterfront where you had breakfast. TIP There are some restaurants and cafés along the beach, but no public washrooms or change rooms that we could see. When a restaurant ranks number 3 on the island of Naxos, has meals for under 8 euros and a casual, family-friendly atmosphere, you know you’ve hit the jackpot. We tried the Greek specialty of moussaka at every restaurant we visited during our two-week vacation. Hands-down, Scirocco serves the best moussaka. The extensive menu and wine and beer list meant that everyone left full and happy. DIRECTIONS From the waterfront, head away from the Portara and ferry terminal on the main street turning onto Sokratous Papavasilou. Take the first right onto Aristidi Protopapadaki and walk until you get to the roundabout. The restaurant and it’s beautiful patio are on the right. TIP This is the main square in the city and quite a busy roundabout. The wait for the restaurant can be long, the waiting area isn’t a great place for little ones to run around. Make sure you bring some activities to keep them busy if you do have to wait for a table. WE LOVEDRooms were large with balconies and the hotel had a beautiful pool and outdoor space. The location was perfect, 100 meters (328 ft) from St. George’s beach and 200 meters (656 ft) from the town square. It was close to restaurants, the waterfront and a small grocery store. WE DIDN'T LIKEBreakfast was not included. TIPWe opted to have laundry done while we were here, while not inexpensive the front desk staff arranged for it to be done and returned to our room in less than 24 hours.